UCS identified up to 353 coal-fired generators nationwide that are uneconomic compared with cleaner alternatives and are therefore ripe for retirement. These units are in addition to 288 coal generators that utilities have already announced will be retired. 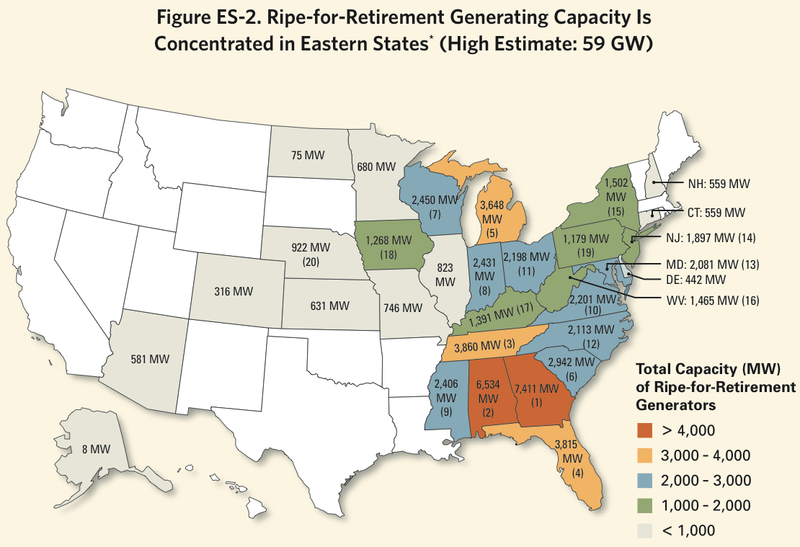 Under the high estimate, there are 19 states with more than 1,000 MW of ripe-for-retirement coal-fired generating capacity, all in the eastern half of the United States. The Union of Concerned Scientists has gone through the catalog of America’s coal plants, and found hundreds of mostly small, old, polluting, inefficient generating units that just aren’t worth operating any more, even on a purely economic basis. They looked at several different sets of assumptions, including different natural gas prices going forward, a price on carbon, whether or not the competing natural gas fired generation would need to built new, or whether it existed already with its capital costs paid off, and whether or not the production tax credit for wind ends up being renewed. In all of the scenarios considered, they found substantial coal fired generation that should be shut down on purely economic grounds, above and beyond the 288 generating units that are already slated for retirement in the next few years. They also found that some companies — especially those in traditionally regulated monopoly utility markets in the Southeast — are particularly reluctant to retire uneconomic plants, and suggest this may be because they can effectively pass on their costs to ratepayers, who remain none the wiser.